There is plenty advice out there for winterizing a home that will be vacant. But what about the house we’re living in, when the temperature drops significantly? If you’ve ever experienced a burst pipe, you know it is one of the most costly damages that can occur. 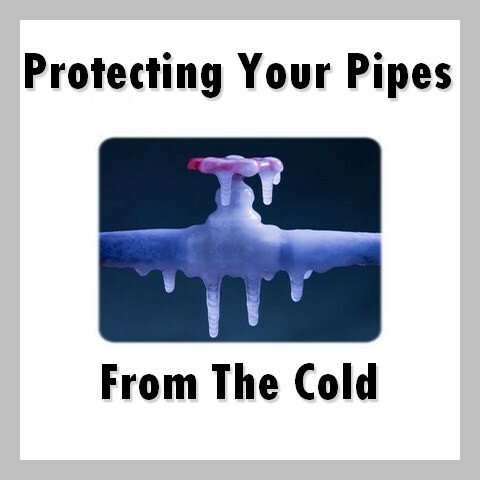 There are some steps you can take to reduce the chances of frozen, burst pipes. Before the cold arrives, you should be removing, draining, and storing all of your garden hoses. The inside valves (bibs) that feed your garden spigot should be closed, and the outside hose bibs should be open to allow any water in the line to drain out. Keep the outside valve open. Pipes that run along outside of the home or are in colder places such as the garage or along an exterior wall that isn’t well insulated can be fitted with a “pipe sleeve” to help insulate them from the cold. Building supply stores carry these in a number of sizes. If there is an extreme dip in temperature, the pipes under your sink on an exterior wall may be especially prone to freezing. You can keep the thermostat at a minimum of 55 degrees and keep a slow drip in your faucet to prevent freezing. If these efforts have failed in the past, you may want to keep your cabinet doors open, and place an old pillow between the pipes and the wall, in lieu of pipe sleeves. If you do have to leave home during the winter, do not shut off the heat. Keep the thermostat at a minimum of 55 degrees, and open the cabinets to allow the warm air to reach the pipes under sinks. Sometimes, despite our best efforts, pipes can freeze. An unanticipated power outage or heating fuel shortage can result in no method to heat your home. If your pipes do freeze or burst, you will want to know exactly where the main water valve is in your home in case you need to shut it off.